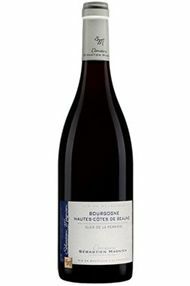 No relation to the Côte de Nuits Magniens, young Sébastien comes instead from Meloisey in the Hautes Cotes de Beaune – a village whose wines were as well thought of as those of Volnay in the 14th century, and were served at the coronation of King Philip II Augustus in 1180. However to be in the thick of things Sébastien has transferred headquarters to revamped cellars in the middle of Meursault. White wines come from the Hautes Côtes, St Romain and Meursault, the red wines from Volnay, Pommard and the Hautes Côtes including an excellent Clos des Perrières from Meloisey. If he can, Sébastien looks to locate village vineyards immediately beside Premiers Crus, and here his land is right under Les Roncerets, at the top of Les Échards. Only a barrel was made, but only a little more than two barrels appear in a good year. With lots of red cherry and violet perfume, the wine is glossy and silky on the palate, and definitely seductive. Drink 2020-2025. 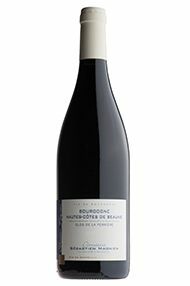 No relation to the many Magniens of the Côte de Nuits, young Sébastien comes instead from Meloisey in the Hautes Côtes de Beaune – a village whose wines were as well thought of as those of Volnay in the 14th century, and were served at the coronation of King Philip II Augustus in 1180. However, to be in the thick of things, Sébastien has transferred headquarters to revamped cellars in the middle of Meursault. He is equally adept at making red and white wines. Sitting (relatively) modestly on Sébastien’s shelf in his tasting area is a trophy: for the Jeunes Talents Côte de Beaune 2016. Sébastien’s star is certainly rising, and fully deserved. Everything here is precise and considered. His vineyards in Beaune, Puligny and St Romain were not frosted, but there are significant reductions elsewhere throughout his range. Much of Sébastien’s focus is in the vineyard, where he tries to capture the spirit of each of his wines. The difficulties of the spring aside, he is very happy with his results this year. He has also been paying particular attention to the toast levels of his barrels, with an even more discreet, integrated result. This is on the higher part of Pommard at 300 metres, above Les Charmots, but south-facing. This is really quite mineral; there is black fruit and a hint of iron on the nose (a good thing). On the palate, it is complex, tight and deep. There is a really understated concentration here, and the finish is long and resolved. This tightly wound, nutty, and spiced apple-flavoured Meursault wine offers hints of white flowers and peaches. It is lush, soft and appealing. Drink it over the next 4 years. The quality shows in the persistent finish. The Clos de la Perrière is one of the outstanding sites of the Hautes Côtes de Beaune, facing south on stony and shallow soil. The nose has a lovely, lifted perfume which leads on to a textured palate packed with pure red-cherry fruit and dense tannins. This will truly hit its stride with a few years in bottle. Drink 2020-2024. A short tour of one of Sébastien Magnien’s vineyards tells all you need to know about his philosophy; each vine is perfectly manicured, with not a leaf out of place. This attention to detail is reflected in his wines, which are precise, steely and mineral. Sébastien’s choice of picking date is guided by acidity rather than sugar levels, putting the emphasis on freshness. He declared himself very happy with 2017, comparing the white wines to 2014 but with perhaps a touch more flavour ripeness, and praising the accessible, moreish character of the reds. While officially a village wine, Sébastien’s vines are at the top of this vineyard, touching the Premier Cru of Ronceret. This wine offers excellent Volnay typicity, with bright red-cherry fruit and violets on the nose and a fine, ethereal palate resplendent with succulent strawberry and silky tannins. Drink 2020-2025. This is a sunny, south-facing location which is situated at a relatively high 300 metres’ altitude and subject to cooling winds. These elements combine to give aromas of perfectly ripe red and black cherry fruit intertwined with lifted, floral aromas and sweet spice. Initially fleshy, the palate finishes with fresh, chalky tannins and vivacious acidity. Drink 2021-2027.